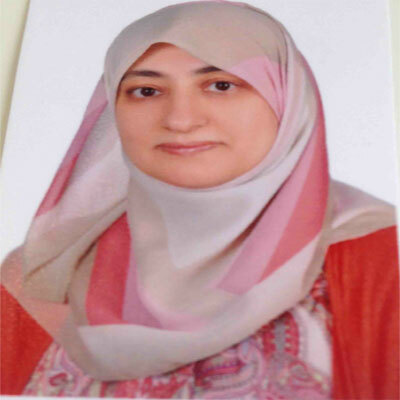 Dr. Raida Wajih Khalil is currently working as Vice Dean, Faculty of Science and Associate Professor at Philadelphia University, Jordan. She has completed her Ph.D. in Molecular Biology from University of Aberdeen, United Kingdom. Her main area of research interest focuses on the Molecular Mechanism of Mammalian Gene expression In Vitro, and Human Molecular Genetics analysis. She is also serving as member of editorial board and reviewer for number of journals. She also served as external examiner for around 25 MSc thesis in material research at different Jordanian Universities. She has 14 publications in journals contributed as author/co-author. Yousef, S.H., A.M. Rawashdeh, R.W. Khalil, S.K. Abdel-Hafez and K.M. Al-Qaoud, 2015. Production and characterization of a recombinant camel full heavy chain antibody against human IgE. Jordan J. Biol. Sci., 8: 257-262. Al-Qaoud, K., S. Yousef, A. Rawashdeh, R. Khalil and S. Abdel-Hafez, 2015. Blocking of histamine release and IgE binding to FcεRI on human basophils by antibodies produced in camels. Allergy Asthma Immunol. Res., 7: 583-589. Bustami, M.R., N. Dakkak, L.F. Abu-Qatouseh, R. Khalil and K.Z. Matalka, 2014. Value of phenotyic and genotypic identification of Acinetobacter baumannii isolates from two hospitals in Jordan. Int. Arabic J. Antimicrob. Agents. Vol. 4, No. 4. 10.3823/762. Badran, E.F., H.A. Battah, K.F. Akl, R.W. Khalil and I. Al Amori, 2013. Detection of novel LAMA3 mutation in Herlitz junctional epidermolysis bullosa in a Jordanian family. Australasian J. Dermatol., 54: 218-221. Khalil, R., M. Khanfar, M. Abu Halaweh, M. Yacoub and M. Bustami, 2011. Assessment of the preserving efficacy of the pharmaceutical syrups to identified air-borne microorganisms. Trends Applied Sci. Res., 6: 198-203. Shabsoug, B., M. Zaater, R. Khalil and A. El-Rjoob, 2010. Zinc content in human hair of healthy and sick subjects. J. Bahrain Med. Soc., 22: 89-91. Mustafa, B., N. Mustafa, M. Kashmoola and R. Khalil, 2009. Relation between estrogen level, Anti-Ro (SSA), Anti-La (SSB) and secondary sjogren's syndrome patients. Eur. J. Scientific Res., 31: 184-187. Khanfar, M., R. Khalil and A. AbuJafal, 2009. Evaluation of preserving efficacy for different cough syrups manufactured by different pharmaceutical companies. Int. J. Pharmacol., 5: 319-322. Khalil, R., F. Al-Sheyab, E. Khamaiseh, M.A. Halaweh and H.A. Abder-Rahman, 2009. Screening of Mutations in the GCK Gene in Jordanian Maturity-Onset Diabetes of the Young Type 2 (MODY2) Patients. Genet. Mol. Res., 8: 500-506. El-Jalil, H.A., R. Khalil, M. Jallad, M. Bustami, F. Al-Jawad and A.J. Thwaini, 2009. Mec A and PVL genes in methicillin resistant Staphylococcus aureus from nasal carrier individuals exposed and not exposed to hospital environments. Arab J. Pharmaceut. Sci., 3: 5-9. Shabsoug, B., R. Khalil and N. Abuhafeil, 2008. Enhancement of natural killer cell activity in vitro against human tumor cells by some plants from Jordan. J. Immunotoxicol., 5: 279-285. Khalil, R., N. Abuharfeil and B. Shabsoug, 2008. The effect of crataegus aronica aqueous extract in rabbits fed with high cholesterol Diet. Eur. J. Scientific Res., 22: 352-360. Al-Din, A.S.N., A. Kurdi, A. Mubaidin, M. El-Khateeb, R.W. Khalil and A.L. Wriekat, 1996. Epidemiology of multiple sclerosis in Arabs in Jordan: A comparative study between Jordanians and Palestinians. J. Neurol. Sci., 135: 162-167. Al-Din, S.N., M. El-Khateeb, A. Kurdi, A. Mubaidin, A. Wriekat, A. Al-Shehab and R.W. Khalil, 1995. Multiple sclerosis in Arabs in Jordan. J. Neurol. Sci., 131: 144-149.